Note UPDATE for today’s Crissy Field action to Alamo Sq 11AM. Be courageous. Be careful. Organize to end white supremacy. Last week in Boston, a white supremacist rally ended early because tens of thousands of people like you flooded the streets in protest. Since the violence and murder of Heather Heyer by white supremacists and Nazis in Charlottesville, thousands of Americans from across the country have come together in powerful demonstrations of racial justice and solidarity. But it’s not over. Now we’re faced with the decision of what to do when they gather in the Bay Area this weekend. We’ve got to build broad support against white supremacy and fascism – and for our communities and our planet – for our efforts to succeed in this moment… and beyond. Why? Because white supremacy, as a system, is not a fringe faction made up of individual marchers. These people are part of an organized political movement vying for even more racist control. The stakes are too high to allow them to win. We need to tear down not just Confederate statues, but all the monuments of white supremacy among us — in the form of decisions by CEOs, politicians, and yes, regular people that keep people of color in poverty and out of power. We can start by prioritizing community defense efforts and the frontline leadership of communities targeted by white supremacy. Bay Resistance’s principles include strategic nonviolence and self-determination. So this weekend, let’s be clear that white supremacy is what is violent, and that our fight is with white supremacy. We also commit to valuing power across difference, including that we do not criminalize or denounce other protesters. We do strive to be accountable to each other for our actions and their impacts. We choose each other; we choose to struggle towards the broad movement against white supremacy and fascism that we need to win. This weekend, whether we choose to line up in front of the fascists to oppose their racism; rally to celebrate our values of justice and inclusion at a different location; provide childcare for marchers with little ones; or simply show up en masse to overwhelm them with our presence, we can all contribute. That said, there are very real risks and dangers to those who choose to participate. We know from previous white supremacist actions in the area that regardless of what we do, the white supremacists are likely to incite violence and may even attack isolated people on the surrounding streets. 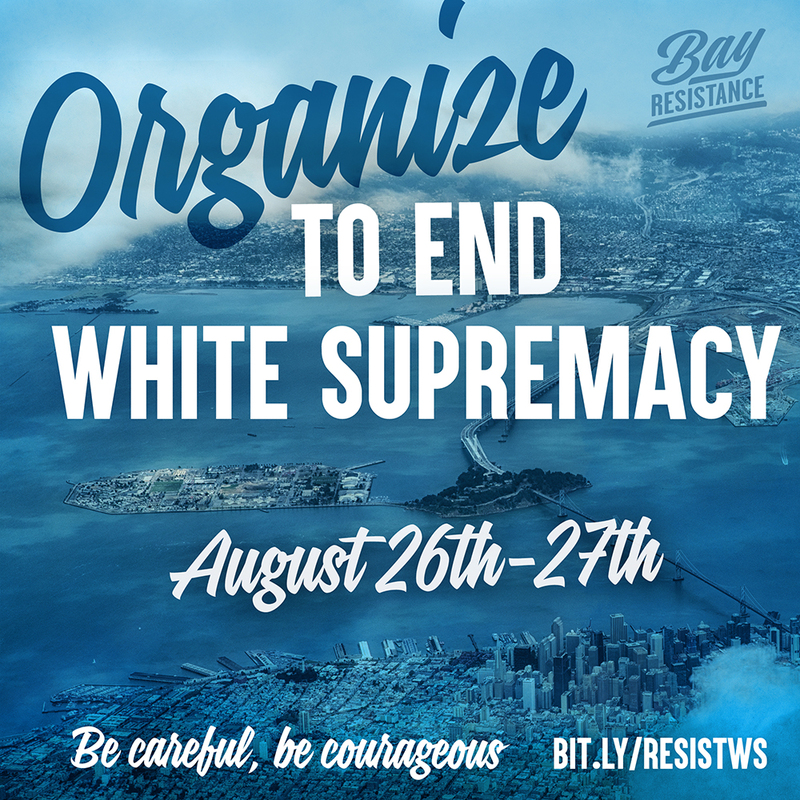 Bay Resistance has worked with many of the organizers planning the protests and we offer the following information so you can determine what makes sense for you. Saturday, August 26 in San Francisco: March Against Hate to Crissy Field NOTE LOCATION CHANGE 11AM Alamo Sq. Steiner and Hayes. Tens of thousands of people were ready to go and stand against hate, forcing Patriot Prayer to cancel their rally. But they plan a press conference at 2pm. We will be there at 11am. Text RESIST to 41411 for urgent updates. Saturday, August 26 in San Francisco: Juanita MORE’s Official Art Event for Equality 12PM – 2PM Harvey Milk Plaza. LGBTQ organizers invite all communities to rally together for equality and democracy. The Women’s March SF’s Rally and March for Equality is meeting up with this event. 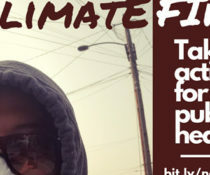 Sunday, August 27: Playdate, teach-in, and discussion space 10AM – 12PM, Frog Park 5353 Miles Ave. Oakland. About sanctuary homes and anti-racist action. Sunday August 27: Free racial justice daycamp 10AM -5PM, Frog Park 5353 Miles Ave. Abundant Beginnings and others will provide a free safe space for your kids while you counter protest. Sign up here. 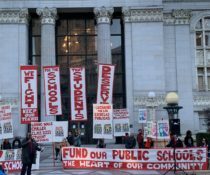 Consider attending protest safety and security trainings by Community Ready Corps. Tuesday, August 22 6PM-8PM with SURJ SF at Bethany United Methodist Church, 1270 Sanchez St. SF. Facebook event here. Study maps of the area and print maps out so you can stay oriented in case you can’t access a maps app on a smartphone during the action. Visit the space beforehand to check it out. In SF, Crissy Field is federal land – consider the risk of arrest and its consequences for non-citizens. Federal law enforcement may also be present in areas approaching Crissy Field. Arrange to go with a group and stick with them, including when joining and leaving actions. Also make sure to have a buddy – stay near by them at all times and know how to contact each other and where to meet up if you get separated. Take a minute to talk through worst-case scenarios so you’re mentally prepared for what might happen. Know what kind of support your buddy might need in different scenarios, including any particular medical support. Be aware of being herded into spaces where you can be cut off from help and surrounded. Always keep an eye on the nearest exit routes and be mindful of places where you can get to safety if needed. Arrange a meetup spot for if you get lost or separated from your group. Surveillance that jams cellphone signals may prevent communication or block you from accessing the internet. Check your phone’s digital security, consider not bringing your phone or using a cheap, temporary phone. water to drink and healthy snacks or a meal. cash in case you need to grab a taxi or need supplies on the go. hand-held signs rather than signs held on sticks, in case police consider those potential weapons and block you from entering. simple protection against chemical weapons, such as milk or Maalox-type antacid to wash skin or eyes if pepper sprayed, or a small ziplock bag with cloth soaked in apple cider vinegar or water for breathing through during tear gas exposure. medicines or supplies such as sunscreen, inhalers, epi-pen, insulin, or menstruation products. Bring several days of prescription medication and doctor’s note in case of arrest. Write the phone number of the National Lawyers’ Guild (415-285-1011) on your arm. Carry the name and number of a designated emergency contact somewhere safe. This person should be someone who is not on site at the action, who will wait for your call after the action and be ready to coordinate legal or medical support, for example if you are arrested. Wear comfortable shoes and clothes you can run or move quickly in. Plan for your favorite de-stressing and recovery activities after the action, either alone or with others. Debriefing with your group or your buddy is also a great way to emotionally process, learn from each other, and continue to build relationships to end white supremacy.